Have you ever had a situation in life where you wanted to give up and stop doing whatever you are doing or whoever you are being? I have! I think back to the time shortly after I lost my second kidney transplant. My level of disappointment was so high that I didn`t eat, talk or move for about two weeks! And it wasn’t just that, it was so bad that I thought about taking my life! 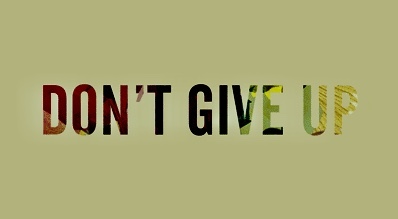 Life can get very tough at times and I think we all have been at a certain point where we probably wanted to give up! In this blog I would like to share a passage from John 5 and look at it from my viewpoint – that of someone who has wanted to give up many times in life. “Sir,” the invalid replied, “I have no one to help me into the pool when the water is stirred. While I am trying to get in, someone else goes down ahead of me. ”Then Jesus said to him, “Get up! Pick up your mat and walk. ”At once the man was cured; he picked up his mat and walked. The day on which this took place was a Sabbath. Below I want to share two points, and my deepest desire is that they will help you if you are currently at a point where you want to give up, or if a “giving up” situation appears in the future! I find it very interesting to read that the man has made it to the pool but not into the pool. Verse 7 tells us that he needed help getting in to the water, but we don’t know why this was, or why he couldn’t get help”. But looking at that situation, I think he came to a point to give up where he thought he wouldn’t win the fight at all! It`s common for us to give up shortly before the breakthrough. We usually don`t give up at the beginning or in the middle. There is still enough power, perseverance or even excitement in those moments to keep us going! If the battle goes on for years it can be very easy to give up – I have been there! We get tired of fighting. Hope for an end leaves us and it’s as if it will never come back! And we run out of strength to keep going! The devil often lets us fight till shortly before the end. Because everything he does is to stop us at the point just before the breakthrough comes. He wants to steal, kill and destroy our lives with the fight we fight and with the investment we make for it. Don`t give up when the temptation to give up is at its highest! That moment is often a sign that the breakthrough is around the corner! I find it very interesting how much the pool meant to the people (not just this particular man) even once Jesus appeared. Jesus! The one who can heal anyone and anything in a matter of a moment! The man himself makes excuses about getting in to the pool. Firstly he says: “I have no one” even though Jesus was there along with a whole bunch of other people that he could ask. Secondly, he is focused on the pool and not on the one who actually can heal – Jesus. Jesus has the Spirit within him, which was the same Spirit that was in the pool! Often we focus on what is far ahead of us and not on the one who is beside us – Jesus! Don`t limit God to only what you see, feel or can imagine! Stir up your faith that God is much more than what is currently in life and your surroundings! We might only see the “pools” in life, the things that seem impossible to get to! These “pools” do not limit God to bring the healing, breakthrough, restoration, provision that we need etc. He is not even limited by our giving up! He is a God of endless wonders that we can rely on in the most difficult situations! I hope you have been encouraged to not give up in the circumstances that you are in right now! My prayer for you is that you will experience Jesus’ presence in the midst of your difficulties!